I have been reading Rilke's Letters To A Young Poet with great interest tonight. It occurs to me how much this correspondence resembles my exchanges with Joe this semester: talking about what I have been reading, sending in poems, coming to terms with the writing life as a practical necessity. Why should it seem foreign to apprentice with other poets in this way? Though the format is academic, the university is really just a vehicle through which this timeless tradition of mentorship in art continues. And so, I find insights, comforts and calls to action in Rilke's words that are as potent for me now as they must have been for Herr Kappus over a hundred years ago. ... ultimately, and precisely in the deepest and most important matters, we are unspeakably alone. What is necessary, after all, is only this: solitude, vast inner solitude. To walk inside yourself and meet no one for hours--that is what you must be able to attain. There is only one thing you should do. Go into yourself. ... Then, as if no one had ever tried before, try to say what you see and feel and love and lose. ... If your everyday life seems poor, don't blame it; blame yourself; admit to yourself that you are not enough of a poet to call forth its riches; because for the creator there is not poverty and no poor, indifferent place. ... And if out of this turning-within, out of this immersion in your own world, poems come, then you will not think of asking anyone whether they are good or not. ... A work of art is good if it has arisen out of necessity. ... one can only wish that you are trustingly and patiently letting the magnificent solitude work upon you, this solitude which can no longer be erased from your life; which, in everything that is in store for you to experience and to do, will act as an anonymous influence, continuously and gently decisive, rather as the blood of our ancestors incessantly moves in us and combines with our own to form the unique, unrepeatable being that we are at every turning of our life. We must accept our reality as vastly as we possibly can; everything, even the unprecedented, must be possible within it. This is in the end the only kind of courage that is required of us: the courage to face the strangest, most unusual, most inexplicable experiences that can meet us. ... only someone who is ready for everything, who doesn't exclude any experience, even the most incomprehensible, will live the relationship with another person as something alive and will himself sound the depths of his own being. ... have patience with everything unresolved in your heart and to try to love the questions themselves as if they were locked rooms or books written in a very foreign language. Don't search for the answers, which could not be given to you now, because you would not be able to live them. And the point is, to live everything. Live the questions now. Perhaps then, someday far in the future, you will gradually, without even noticing it, live your way into the answer. Irony: Don't let yourself be controlled by it, especially during uncreative moments. ... Search into the depths of Things: there, irony never descends ... For under the influence of serious Things it will either fall away from you (if it is something accidental), or else (if it is really innate and belongs to you) it will grow strong, and become a serious tool and take its place among the instruments which you can form your art with. And your doubt can become a good quality if you train it. It must become knowing, it must become criticism. Ask it, whenever it wants to spoil something for you, why something is ugly, demand proofs from it, test it, and you will find it perhaps bewildered and embarrassed, perhaps also protesting. But don't give in, insist on arguments, and act in this way, attentive and persistent, every single time, and the day will come when instead of being a destroyer, it will become one of your best workers--perhaps the most intelligent of all the ones that are building your life. Read as little as possible of literary criticism--such things are either partisan opinions, which have become petrified and meaningless, hardened and empty of life, or else they are just clever word-games, in which one view wins today, and tomorrow the opposite view. Works of art are of an infinite solitude, and no means of approach is so useless as criticism. Only love can touch and hold them and be fair to them.--Always trust yourself and your own feeling, as opposed to argumentations, discussions, or introductions of that sort ... Allow your judgments their own silent, undisturbed development, which, like all progress, must come from deep within and cannot be forced or hastened. Art too is just a way of living, and however one lives, one can, without knowing, prepare for it; in everything real one is closer to it, more its neighbor, than in the unreal half-artistic professions, which, while they pretend to be close to art, in practice deny and attack the existence of all art--as, for example, all of journalism does and almost all criticism and three quarters of what is called (and wants to be called) literature. I am glad, in a word, that you have overcome the danger of landing in one of those professions, and are solitary and courageous, somewhere in a rugged reality. To let each impression and each embryo of a feeling come to completion, entirely in itself, in the dark, in the unsayable, the unconscious, beyond the reach of one's own understanding, and with deep humility and patience to wait for the hour when a new clarity is born: this alone is what it means to live as an artist: in understanding as in creating. ... we must trust in what is difficult; everything alive trusts in it, everything in Nature grows and defends itself any way it can and is spontaneously itself, tries to be itself at all costs and against all opposition. ... It is also good to love: because love is difficult. ... that you may find in yourself enough patience to endure and enough simplicity to have faith; that you may gain more and more confidence in what is difficult and in your solitude among other people. And as for the rest, let life happen to you. Believe me: life is in the right, always. You have had many sadnesses, large ones, which passed. And you say that even this passing was difficult and upsetting for you. But please, ask yourself whether these large sadnesses haven't rather gone right through you. Perhaps many things inside you have been transformed; perhaps somewhere, deep inside your being, you have undergone important changes while you were sad. The only sadnesses that are dangerous and unhealthy are the ones that we carry around in public in order to drown them out with the noise; like diseases that are treated superficially and foolishly, they just withdraw and after a short interval break out again all the more terribly; and gather inside us and are life, are life that is unlived, rejected, lost, life that we can die of. If only it were possible for us to see farther than our knowledge reaches, and even a little beyond the outworks of our presentiment, perhaps we would bear our sadnesses with greater trust than we have in our joys. For they are the moments when something new has entered us, something unknown; our feelings grow mute in shy embarrassment, everything in us withdraws, a silence arises, and the new experience, which no one knows, stands in the midst of it all and says nothing. We have no reason to harbor any mistrust against our world, for it is not against us. If it has terrors, they are our terrors; if it has abysses, these abysses belong to us; if there are dangers, we must try to love them. ... Perhaps all the dragons in our lives are princesses who are only waiting to see us act, just once, with beauty and courage. Perhaps everything that frightens us is, in its deepest essence, something helpless that wants our love. What's It All About, Ralph? Categories: Insights and Poetry. Tags: Negative Capability. 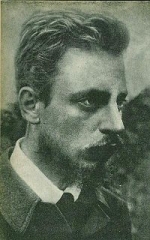 Poets: Rainer Maria Rilke.